... 1782, what an insider called "'the most Signal Epocha, in the History of a Century'" took place. The insider was John Adams. 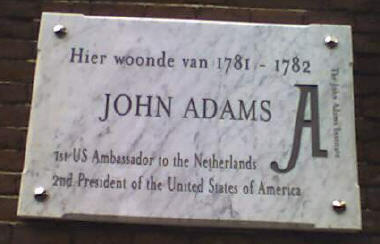 While living in the Amsterdam house on which still may be found the plaque at right, he'd been trying for 2 years to persuade the Netherlands to recognize the fledgling United States as an independent member of the community of nations. (photo credit) On this day, he succeeded, and became his country's 1st ambassador to the Dutch government. According to the editor of his Adams' papers, Adams -- who'd go on to be the 2d President of the United States -- "believed then and for the remainder of his life that this event was the foremost achievement of his diplomatic career." Dutch aid was essential to the Americans' victory in their war for independence from Britain.